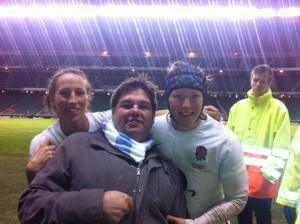 I am a keen follower of the England Women’s rugby team. I have a vested interest due to the fact I share a home with two of the current squad members Rocky Clark and Kat Merchant. I guess like many of the friends and family members of the other squad, I have sat – and I mean sat—and watched the work go in to their world cup preparations. I have seen the physical toll when they come back from some of the camps, and I have heard the limits they have pushed themselves to with awe.